After spending four episodes in the Underworld with Kirito, we finally return to the real world, picking up right where we left it, when Kazuto got injected while protecting Asuna. 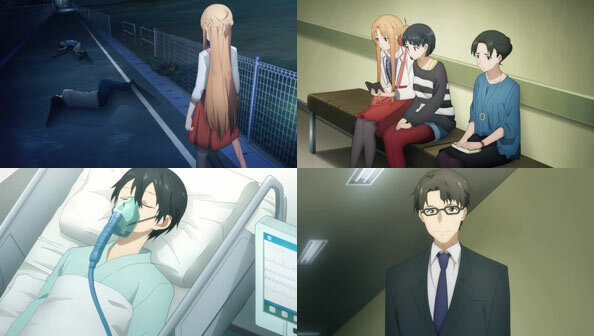 Asuna meets Suguha and Kazuto’s mother at the hospital, where they’re informed that he may never regain consciousness after suffering untold damage when his heart was stopped for five minutes. Then everyone’s favorite morally ambiguous suit Kikuoka Seijirou shows up, telling Kaz’s family that there’s only one place that can treat him properly. They concur, and Kazuto is transferred to another facility, but when Asuna and Suguha try to visit him the same evening, they aren’t allowed. Further, Asuna’s monitor of Kaz’s heart rate is out of range; he’s just gone, and so is Kikuoka. 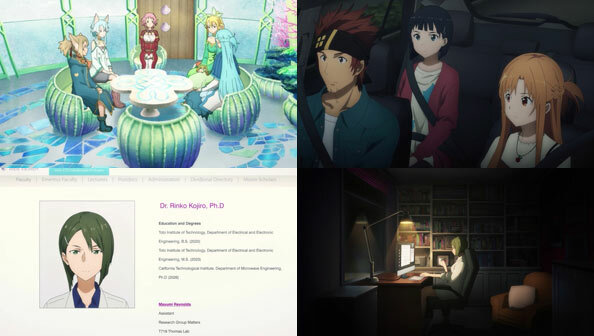 Asuna and Suguha meet with their friends in ALO to bring them up to speed, and with help from Yui they begin to assess the places he’s been and the places he could be now. The group splits up, with Klein driving Asuna and Suguha to a nondescript warehouse and helipad…but there’s no Kazuto, at least not anymore. Apparently at a dead end, Yui tells “Mama” Asuna not to give up, as “Papa” Kirito never gave up looking for Asuna in ALfheim. Agreeing, Asuna asks Suguha if she remembers anything her bro said about his job; she remembers that the machine he used was based on the Medicuboid, designed by Kayaba Akihiro, AKA Heathcliff, inventor of NerveGear and Game Master of SAO. 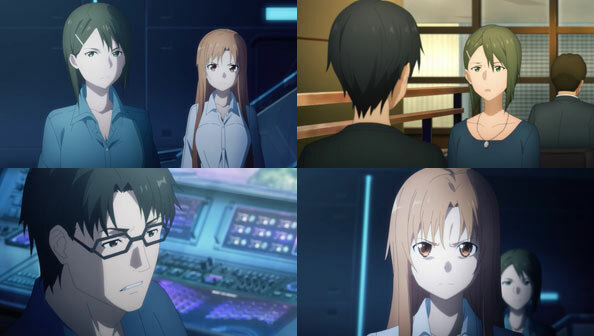 Asuna recalls someone watched over Kayaba while he was diving, then recalls her name: Koujirou Rinko. Yui finds Rinko at a lab in California. She, along with Kayaba, was a member of the Shigemura Lab, which developed the Augma headset. It stands to reason she might know about STL and Kazuto’s wherabouts, so Asuna sends her an email. 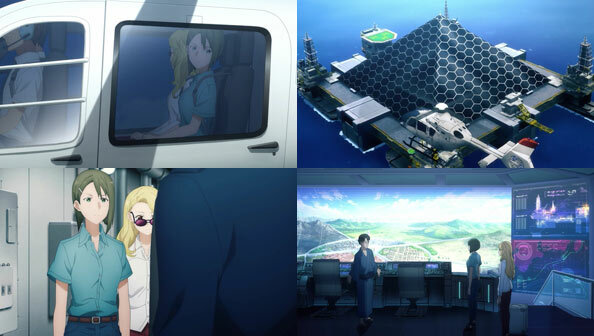 Turns out Dr. Koujirou Rinko has already been hounded by Kikuoka to join him on a new project, and so she travels to his location via helicopter, which turns out to be a Totally Awesome Top Secret Floating Base called “Ocean Turtle.” Rinko is accompanied by her blonde English-speaking, somewhat shifty assistant Mayumi Reynolds. After going through a veritable gauntlet of security checkpoints, Rinko and Mayumi enter a command room that oversees the Underworld Kirito is currently living in. It would seem to be an actual physical environment, which explains why those crossing its boundaries into the “Land of Darkness” are so harshly punished. In the control room they meet Kikuoka, donning yukata and geta as if he were at a seaside retreat. That’s when Rinko reveals why she finally agreed to come: her assistant “Mayumi” is really Asuna in disguise. When Rinko heard from Asuna that Kazuto—whom she met following the death of her lover Kayaba, and who chose not to destroy the World Seed—she decided she’d help Asuna any way she can. And so now Asuna has managed to slip by a number of layers of carefully laid security and is in the very heart of Rath’s operation. And she’s PISSED. She wants to know where Kirito is, pronto. Considering everything she’s been through thus far, including one would hope Kikuoka would be amenable to her request. Now things are starting to get interesting. Forgot to mention Klein’s car is a GP-Series (4th-gen) Subaru Impreza Hatchback…. Indeed…and quite a handsome car it is! Next Next post: SSSS.Gridman – 05 – Wear Some Damn Clothes!